Review published in IJPE, Vol. 8, No. 1, January 2012, p. 66. Part V: How can Progress be Made Towards Global Democratic Governance ? There is no denying of the fact that international organizations such as the United Nations (General Assembly and Security Council), the World Trade Organization (WTO), IMF, WB etc have enough scope of restructuring and reforms in order to achieve greater democratic governance to tackle the several challenges facing the world, today and to make these organizations more effective. This book prepared under the auspices of the World Forum of Civil Society Networks – UBUNTU comprises contributions by leading personalities of the world that includes United Nations past Secretary-General, Mr. Boutros Boutros Ghali and Mr Joseph Xercavin who has been first academic director of the Master degree in Sustainability at the Technical University of Catalonia (UPC) and also created an interdisciplinary doctoral programme in Sustainability. He became the chief organizer of the Ad Hoc Secretariat of the UBUNTU- World Forum of Civil Society Network. Our interest in the book arises from environmental and sustainability initiatives that the world organizations had taken from time to tome but failed to achieve consensus and much-needed visible progress due to lack of effectiveness of these bodies. 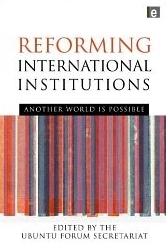 The book provides a diverse and rich resource on all aspects of the reform of the international organizations. This UBUNTU book makes a significant contribution to informing the world citizens of how conditions for a much more just, democratic and sustainable world can be created. This initiative from UBUNTU Forum is well intentioned and non-confrontational and is likely to convince political leaders and officials from international organizations to achieve a common goal of ensuring a safer, prosperous, healthier, and sustainable world. This book published by Earthscan, London as is clear from the table of contents, is very well-structured and well-documented and must be read by all citizens of the world who care about the survival and well-being of this planet. Review published in the International Journal of Performability Engineering, Vol. 8, No. 1, January, 2012, p.66.